We have updated the Climate Scoreboard to reflect the impact of the latest plans countries have communicated to the United Nations to address climate change. This update includes the long-term strategies (or mid-century strategies) that countries have started to submit, which indicate the emissions pathway countries aspire to follow out to 2050. This is in addition to the Intended Nationally Determined Contributions (INDCs) and Nationally Determined Contributions (NDCs) that most countries have already submitted through 2025 or 2030. So far, only the United States, Canada, Mexico, France, Germany, and Benin have offered their long-term strategies, however, the Paris Agreement calls for all countries to submit similar plans by 2020. The expected temperature change in 2100 if all countries follow their plans and do not take any further action is 3.3°C. This is 0.2°C less than where we were before the long-term strategies were included. As countries submit additional NDCs and long-term strategies we will continue to update this analysis. So far countries are not on track to achieving the goals they agreed to in the Paris Agreement of keeping global warming well below 2°C. 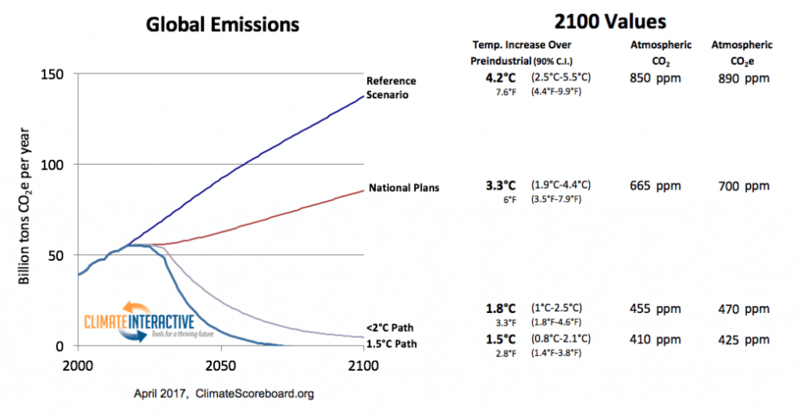 The “<2°C Path” and “1.5°C Path” highlight the trajectory emissions needed to follow in order to achieve this goal. <2.0°C Path – 1.8°C (3.3°F) – All countries peak by 2030 and then reduce steadily, with rates in the post-2030 period faster in the developed countries (5%/yr) than in the developing countries (3.5%/yr). 1.5°C Path – 1.5°C (2.8°F) – All developed countries peak by 2025 and then reduce steadily at 10%/yr; all developing countries peak no later than 2030 and then reduce steadily at 8%/yr. There are many pathways that can achieve the same temperature outcome. However, as we delay significant action, our options become more narrow and emissions reductions must occur at steeper rates. Steeper reduction rates mean more stranded assets and higher economic costs. Updates to the Scoreboard and our C-ROADS simulations also reflect a new reference scenario for fossil fuel CO2 emissions, land use CO2 emissions, and the other well mixed GHG emissions. This reference scenario, also known as “business as usual,” is now lower (leading to 4.2°C instead of 4.5°C), in part because the world is already pursuing a lower emissions path than what was anticipated several years ago. More specifically, the emissions intensity of the global economy has been falling faster than expected. Originally our reference scenario was based on the IPCC’s RCP8.5 scenario, however, the new reference scenario has been developed to better fit updated historical data. The reference scenario accounts the UN’s medium fertility population projections, historical GDP per capita rates that converge over time to be consistent with other integrated assessment models, and GHG per capita projections for each gas that reflect trends over the last decade for CO2 and follow RCP8.5 for the non-CO2 greenhouse gases. This new reference scenario would have 4.2°C (7.6°F) of expected warming globally by the year 2100 (with an uncertainty range of 2.5°C – 5.5°C).